Home / Drug Addiction / Enabling vs Helping: Which One Are You Doing? According to a recent government study, Defining the Addiction Treatment Gap, there are millions of Americans who would benefit from treatment for drugs and alcohol. Currently, there are 23.5 million people in the United States that consider themselves substance dependent. But helping these people isn’t all about getting them to do things your way. When it comes to addiction, you may think that you’re helping someone when really you’re keeping them from sinking to their lowest point where they would get the help they truly need. 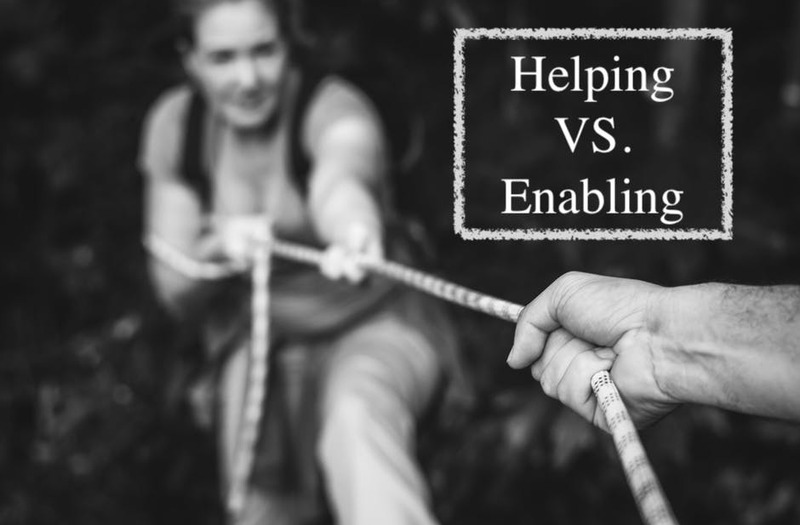 Learn more about helping vs enabling in this post so that you can make the right decisions out of a place of love for someone you care about facing the challenge of addiction. As a human, it’s hard to watch someone you love suffer. You want to do everything you can to minimize the risks someone else is taking resulting in a dangerous family dynamic where you are supporting the habits of an addict. You may even become wrapped up in an addict’s lifestyle choices and find yourself in dangerous situations. As an enabler, you become wrapped up in the web of lies they are weaving and act as a cushion for their behavior with the world. Enabling creates a permissive atmosphere where an addict can manipulate their way out of seeking treatment. Without having all of the consequences of their actions affecting them, they feel no reason to make a change and therefore it becomes easier for them to keep doing what they are doing. One of the first signs you are enabling someone might be the respect you lose for yourself. When you enable a substance user, you know inside that it’s not the right thing to do but you might not know how else to handle the situation. For whatever reason, you may feel like you share the responsibility for your loved one developing an addiction and you want to use your own time, energy, and money to fix the problem. Your goal is to reduce the pain and suffering of your loved one, but you don’t realize that you are actually creating barriers to recovery for them. By recognizing these unhealthy behaviors, you can start to change your patterns and put the focus on getting real treatment and help for the person you love. If you are an enabler, you may not realize how you got that way. After all, you didn’t start off wanting to make the problem worse. Let’s look at all of the reasons someone might subconsciously choose to start enabling. Denial is a primary coping mechanism for many family members dealing with a drug addict’s behavior. You don’t want to accept the reality of the situation that the person need real help. You tell yourself that the person you love doesn’t need treatment because they can handle it all themselves. You convince yourself that they can control their behavior if they really need to. Justification is another dangerous behavior pattern for enabling family members. You may feel like your loved one needs their substances in order to relax after a long day or because they are going through a particularly troubling time. Or you may try to convince yourself that the use is only situational and your loved one will straighten themselves out after they graduate from college or “grow out of it”. One reason many loved ones allow substance abuse behavior to continue is that they want to feel a sense of control over the situation. They feel like if they can keep an eye on the addict and allow them to use drugs in the home, then they will be less likely to get a phone call in the middle of the night telling them that something bad has happened. They also may feel like they can control the number of substances an addict would take if they are in the home. This is a false sense of security since there is nothing keeping the addict from making their own choice at any time. If you have expressed your feelings about a loved one’s addiction before, and they refused to make changes, then you may start to feel like you can’t be effective. You will start to suppress your own feelings about the situation as a way to avoid turmoil and disappointment. Many loved ones of addicts just want to create peace in the home so they will do anything they can to avoid the situation. Instead of going to get help for a loved one, they ignore the situation and do their best to keep up appearances for the family. In order to break the pattern of enabling behavior, you have to convince your loved one that it is time for them to enter an alcohol or drug rehab. The only way they are going to recover from their addiction is if they have the help and resources they need and no other choice but to take the offer. Stop putting the blame for their addiction on yourself and stand up for your values and your home. Change your behavior patterns and make it clear that there will be no tolerance of addiction anymore. Take some time to write down all of the things that you do that would fall under the categories of helping vs enabling. Then, sit down with your loved one and talk to them about the way their addiction is changing your life. Let them know that their behavior won’t be tolerated anymore and draw your line. It’s time to get serious. To learn how to stop enabling and start helping, host an intervention for your loved one in Savannah, Georgia today.